Come and experience the first ever photography exhibition ‘takeover’ at Islington Central Library using photographs taken by Neil Kenlock. 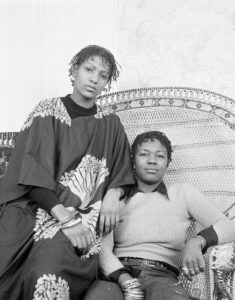 Known for his captivating work focusing on key moments in post Windrush Britain, Kenlock’s powerful Expectations exhibition documents black British history. For the first time visitors can stroll along The Gallery, while exploring ideas of the black British leadership experience in the 1960s and 1970s. The Expectations exhibition is curated by Kenlock’s daughter, Emelia Kenlock, who uses a selection of his black and white prints to explore the notion of leadership at during that period. The photos tell the honest and unique story of the African and Caribbean leaders, who Kenlock was lucky enough to capture, many of whom are unsung heroes. Visitors will see rare prints of key figures such as the formidable anti-discrimination, women’s and squatter’s rights campaigner Olive Morris. There will also be a special print that captured a historic meeting between the community pioneer Courtney Law and of the Home Secretary at the time, Lord Jenkins. For more information on the exhibition or the project please contact our team. This project and exhibition is funded by the Heritage Lottery Fund.